We beat any other companies prices! We beat 'em down so low they never get back up! 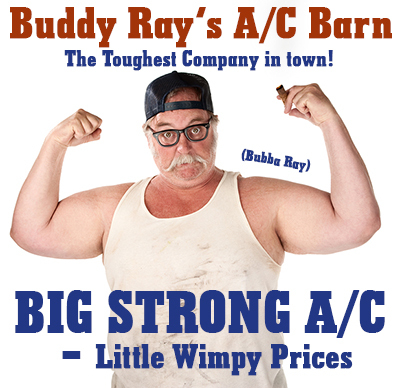 Buddy Ray's A/C Barn has been servicing folks in Sarasota since 1932. We are the oldest Air Conditioning Company in Florida. Our Sarasota AC team has over 135 years of experience in low-abrasion A/C cleaning, air conditioning diagnostic rumination and mechanical visual verification. In 1996 Bo Ray won the coveted silver soldering award of excellence for the second year in a row. We Fix Everything – including: Air Conditioning, Kerosene heaters, and Lawnmowers. We are a full service one stop shop – we do it all. No need to call "professionals" who only know how to do one thing. We can handle your Air Conditioning, plumbing, electrical, and landscaping. We also offer 24 hour emergency dead animal removal services. Nobody can beat our super cheap air conditioning prices – we have barns full of almost new AC units, piles of copper tubing, and lots of parts. We got parts coming out of our ears. Our air conditioning and heating prices are so low you'll probably think we are crazy! Nobody can beat our cheap air conditioning prices - we're less than half what anyone else will charge. Money talks or Buddy's A/C Barn walks. We don't screw around with fancy quotes and incentives. Cash on the barrelhead for the best discount – ask us about our gently used previously loved second hand systems. Wanna go "green" with your A/C? That's a waste of money! Environmentally friendly air conditioning is just another term for Super-Expensive!!! No need to spend money on a brand new high efficiency system – we can keep that old one running for many more days - maybe a couple weeks. That's like cash money in your pocket! Sure you can lower your electric bill with a new system, and there may be tax rebates and such, but figuring out all those complicated rebate forms takes a lot of time, and would you rather pay us to read books or fix your AC? Buddy Ray likes to keep it plain and simple. It's broke – we fix it! Best of all - our employees are part time and we pay cash under the table while they collect unemployment – that spells BIG SAVINGS for you! Since we don't pay insurance or licensing fees we pass those savings on to you as well. Buddy's AC installs the biggest AC Units - the bigger the better - and more bang for your buck! Pick up the phone today and save big money with Buddy Rays AC Barn!